For those who want to earn some free meals at your hotel stay might want to look into this hotel in Denmark. You’ve got to admire this hotel’s unique way of giving their guests a break while power is generated. 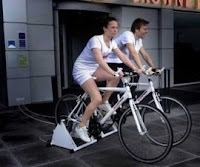 Now, if these bikes were put in the gym rather than outside the hotel, then you’ve got a marriage of physical fitness and green power! Speaking of green power, I’ve discovered that this same hotel also has solar panels up on the roof. All it needs now is someone pedaling all the time, and this place would be practically self-sustaining. 0 Responses to "Danish hotel lets guests generate power for their meals"